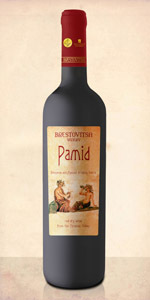 Regional wine of the specific sort Rubin obtained by selection between Nebiollo and Syrah, brought up by experienced growers of Brestovitsa village. Rubin wine varietal is rich in antioxidants among all the red wines, distinguished by its ruby red color and characteristic flavor of the grape variety. The wine is soft with good body, suitable for meat dishes, pasta and various cheeses.